Plan To Make 6 States Out Of California May Head To Ballot : The Two-Way The plan would create states with names such as Jefferson, Silicon Valley, South California. The constitutional amendment needs more than 800,000 signatures to qualify; backers say they have enough. 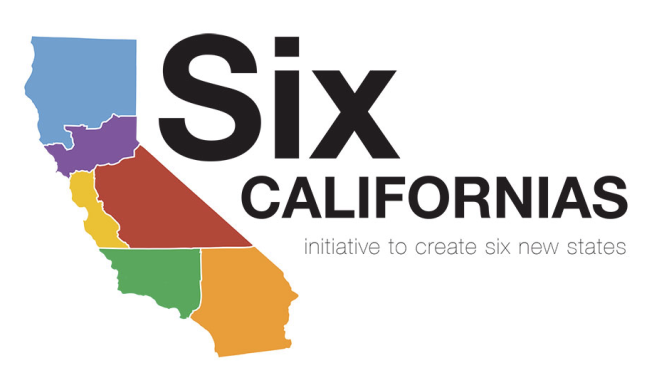 An image from the Six Californias website shows the proposed borders of its plan to slice the state into areas that the plan's backers say would be more manageable. The initiative's main backer is tech industry investor Timothy Draper, who plans to hold a news conference today to officially announce that his group has enough petition signatures to move the plan forward. The constitutional amendment would need more than 807,000 valid signatures to qualify, SFGate reports. If the Six Californias petition is verified, the ballot proposal wouldn't come up for a vote until 2016; to be enacted, the plan would require the approval not only of California's Legislature, but also of the U.S. Congress. Draper has said he wants to create areas that are governable — something he says California is not as it is currently constituted. "We pay the most for education and we're 46th," Draper told Marketplace earlier this year. "We pay among the most for prisons, and we are among the highest recidivism rate. So we have a failed state." "Even if the California Legislature were to sympathize with the initiative, the task of dismantling the state's regulatory infrastructure would be mind-boggling. Take for instance an issue on everyone's mind right now, that of water. Splitting the state would put the water supply for the state's largest urban area in question, as well as for much of the rest of the state." Long before Draper unveiled his plan, Clarke notes, many similar movements had already failed in California.